Why should you use a car ramp to change oil? If you are someone who likes performing maintenance on your own car, or likes to save money, changing oil at home is a great option. There are many tools that can make this process easier, but car ramps are going to be the most beneficial. Car ramps have many advantages over car jacks for lifting the front end of a vehicle. These reasons include convenience, price, and safety. And since most people don’t have a 2 post car lift in their home garage, anyone who regularly changes their oil at home should invest in a set of quality car ramps. 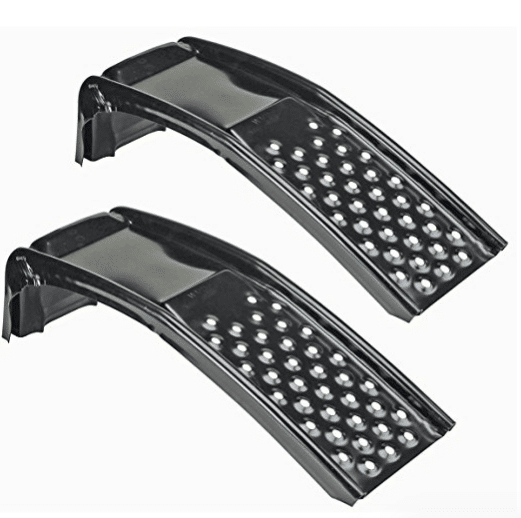 Click the buttons above for detailed information about each product, or read on for our review of each of the top 3 car ramps for changing oil. 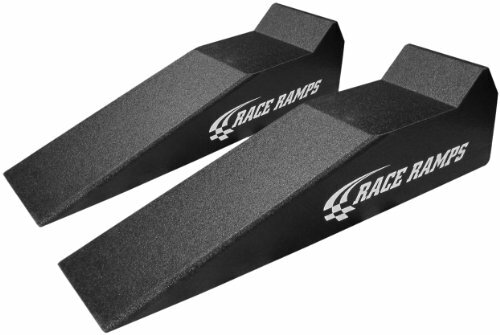 Our top choice for the best product in this review is the Race Ramps RR-40. As the name implies, this ramp is designed for sports cars. Lightweight, functional, and very durable, this ramp is easily the best in its class. As previously stated, this ramp is designed for sports cars. The low ramp grade and length of the unit allow very low profile cars to be lifted up. However, this ramp is still able to be used with regular cars. This ramp is constructed with a lightweight yet durable composite material that really increases the convenience of the tool. 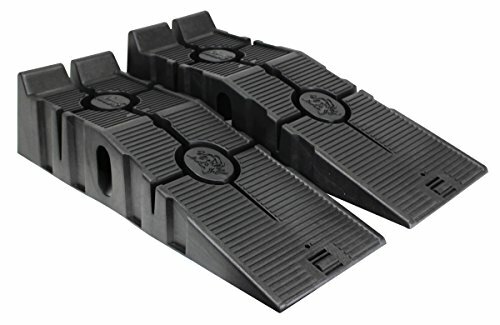 The bottom of the ramps are extremely grippy, which means you don’t have to worry about them sliding while driving the car up on them. These ramps also come with carrying straps that make pulling them in and out of action even more convenient. It is worth noting that this 40 inch model works with most sport car models, but does not work with extremely low profile vehicles like corvettes. For lifting these cars, try using the longer 56 or 67 in ramps. 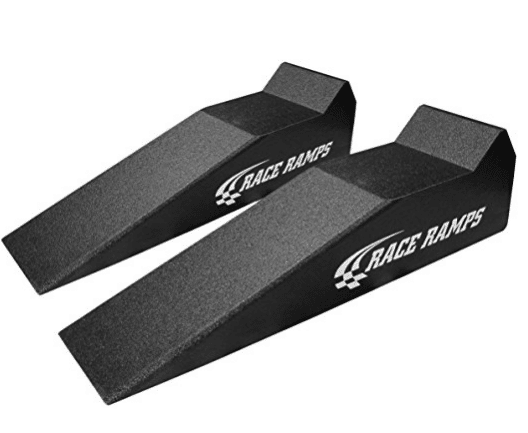 After researching dozens of customer reviews for the Race Ramps, we have come to the conclusion that almost all purchasers were satisfied. Product testers had things to say like “They’re the easiest ramps I’ve ever driven up on. They don’t move at all when driving up, or back down. A breeze to use solo” and “To date, this is the ONLY ramp that I have not noticed a sag or break after using them”. Overall, The Race Ramps RR40 offers amazing amazing functionality and convenience, and they can be purchased at very reasonable price point. Investing in these ramps will make changing the oil on your car no longer seem like a chore. The next best option for car ramps is the Nicky Nice Solid Steel Auto Ramp. Being a quality product that is more than capable of holding most vehicles, and costing less than a third of most other options, these ramps really impressed us. The Nicky Nice ramps are constructed out of a high quality solid steel which not only increases durability, but weight capacity. The ramps are rated to hold up to 2,000 pounds each, or a 6,500 gross vehicle weight. The total length of the ramps is 35 inches. 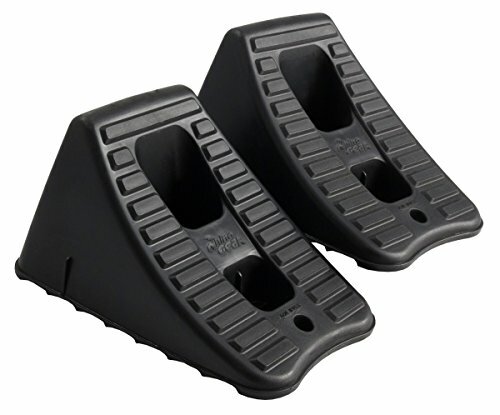 The inclines have protruding holes that provide excellent traction. This in combination with raised ribbed sides means there is no worrying about sliding off of the ramps. The Nicky Nice ramps are a well reviewed set. With almost 100 4-star or better reviews, customers were very happy with this purchase. One criticism of these ramps is that the incline of the ramp is very steep. Although this may be a negative for some, it also increases the room under the car for performing oil changes or other maintenance. These ramps are a great low cost option, while still being durable. If you don’t want to spend a fortune on car ramps but still get something durable, this is the option for you. The final product in our review of the best car ramps for changing oil is the RhinoGear 11909ABMI . These ramps are the lowest priced ramps that will get the job done safely. This is a great choice for someone looking to save money. 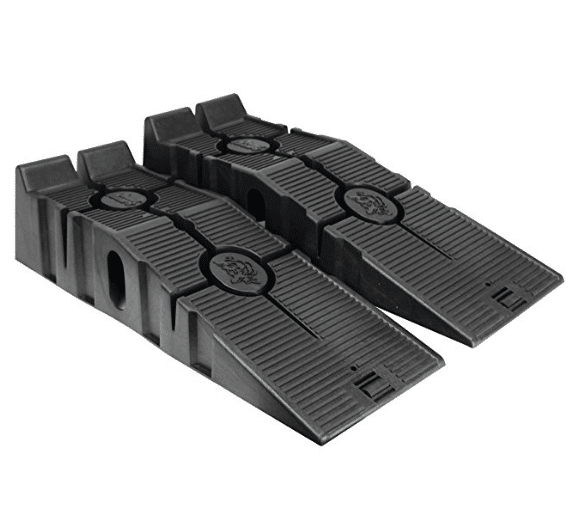 The RhinoGear ramps are created with a low-weight composite material, with a high traction design to prevent slippage. The ramp has a 17 degree incline, which makes it great for use on low-profile vehicles. The total ramp length is 22 inches. Also, there is a lip on the top of the ramp to prevent going too far. This is the most reviewed ramp on Amazon,with almost 2,000 total reviews. Averaging a 4.5 star-rating, customers loved this ramp. 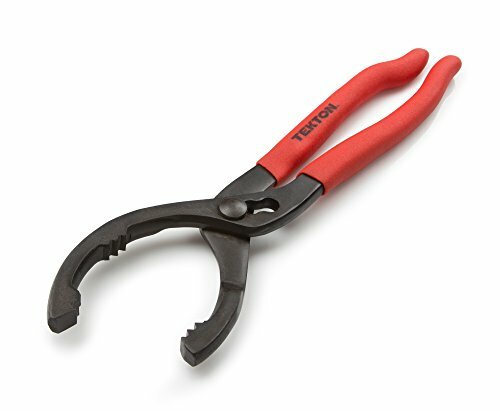 Although, some customers had concerns of low durability with cracks showing up after use. These ramps are the best budget option out there, with a crazy low price If you are looking to save money and change your own oil, this ramp set will help you get the job done. While the other two recommended products will make changing the oil in your vehicle easier, they really aren’t absolutely necessary. Wheel chocks, on the other hand, absolutely are. A person should never go underneath a lifted vehicle without wheel chocks in place to prevent rolling. Purchase a set of these and never again worry about safety under the vehicle. When draining the oil out of your car, the oil needs a place to go. Yes, you could just let the oil drain into some homemade container, but this will likely just cause a mess. Having a specially designed oil pan will prevent oil stains on your garage and driveway and make disposal easier. Unfortunately, auto shops tend to tighten oil filters way too tight to be unscrewed by hand. A good set of oil filter pliers will solve this problem. As well, it will prevent you from burning your hand on hot engine bay parts. There are many reasons why car ramps are superior to car jacks when it comes to changing the oil. First, they are more convenient. It takes less than a minute to drive a car up on the ramps. On the other hand, jacking up a car safely can take several minutes. A second reason is the price point. 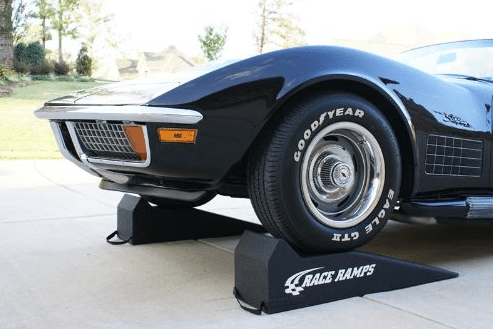 A good quality car ramp set can be as cheap as $40, while quality jacks and jack stands can run into the several hundred dollar range. One last reason is safety. Jack stands often have cheap interior parts that can fail, leading to disastrous results. Park the vehicle on a flat, stable surface. Line the ramps up in front of the wheels. Be careful to make sure that everything is securely in place before going under the vehicle. Wheel chocks are an absolute necessity for this.